Kleztory’s roots go back to 1997, when guitarist Alain Legault founded Les Gitans Sédentaires. Joined by bassist Mark Peetsma, the group performed more than two hundred shows in the following two years. In 2000, this fine tuned rhythm section was joined by the classically trained clarinetist, Airat Ichmouratov, and became known as Simha. In early 2002, with the addition of violinist Elvira Misbakhova and accordionist Henri Oppenheim, Kleztory became a traditional klezmer ensemble and is one of the most dynamic klezmer ensembles in Canada today. 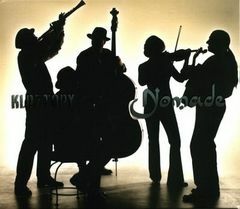 Klezmer is the traditional music of nomadic Jewish musicians who traveled throughout Eastern Europe in the nineteenth and twentieth centuries. These musicians took inspiration from the popular music of the day and integrated their own unique vocabulary, born from a history that was rich and too often tragic. Similar to the music they perform, Kleztory is a rich mosaic of cultures (Russian, Canadian, Quebecois and French), musical training (academic and self taught) and musical tastes (classical, contemporary, jazz, blues, country and folk). Combining their talents, these . ve musicians perform with an emotion and a virtuosity that is the true spirit of klezmer. Th rough the use of innovative arrangements that are respectful of the original compositions, Kleztory has forged a unique, yet still authentic musical path. Diverse cultural backgrounds, passion, experience and dedication make Kleztory an exciting and unique ensemble in the world music scene.